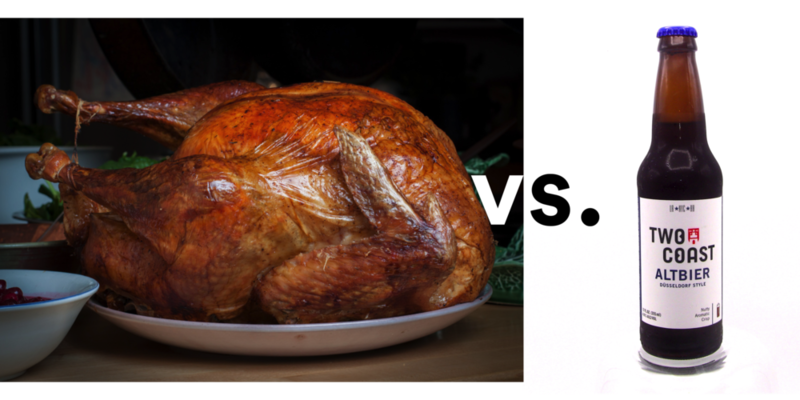 The question is as old as turkey in December - what beer to pair with the holiday bird? Hint: it's not an IPA unless you plan to baste your turkey in fire and brimstone. Holiday meals tend to be moderate affairs when it comes to seasoning and any hop-bomb will overpower whatever flavor you manage to coax out of a bird that is not exactly brimming with it. Look instead for something malty, chestnutty from Germany or Belgium to go with jacket weather. Just like the holiday itself the meal calls for harmonious-minded, complimentary beers. "Thanksgiving is not the time for contrast pairings", a NY chef is quoted in the NY Times whose editor is calling for European beer icons to do the job. A fine Pilsner or a Belgian farmhouse ale with its spicy undertones without having any fashion-y spices added to start the appetizers. A heavier Doppelbock or a malty dark Altbeer for the main course, a hefty coffee stout to finish off Drunk Uncle with dessert. The lesson: un-frilly dark and bright lagers, Pilsners and malty delicacies are Thanksgiving guests you can count on to deliver. These are beers Two Coast Brewing happens to excel in.